Gold rose to three-month highs in Europe on Friday as concern over the fiscal outlook for peripheral euro zone economies boosted safe haven flows into the precious metal, with a rebound in the euro also lifting prices. Holdings of the world's largest gold-backed exchange-traded fund, New York's SPDR Gold Trust, rose nearly 10 tons to a record 1,140.433 tons on Thursday, its biggest one-day rise since September. Spot gold peaked at $1,157.25 and was bid at $1,155.65 an ounce at 0927 GMT, against $1,150.15 late in New York on Thursday, Reuters says. Analysts said the resurgence of worries over Greece's debt problems this week have prompted investors to buy gold as a safe haven against currency volatility. Greek government officials said Friday that the country still plans to sell dollar bonds in the U.S. in April despite yields having reached 12-year highs. 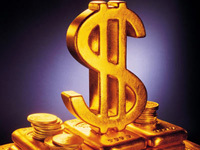 Even though the euro's recovery Friday reflects an easing in those concerns, gold's technical factors and gains in other commodities may take over in the near term, traders said. A London-based trader said gold's steady climb has yet to trigger any heavy selling, suggesting investment demand for gold is stronger than expected, and some market players are still looking for higher prices before shorting, Wall Street Journall informs.